Why Are Weaponized Cell Phone Towers Being Constructed Everywhere? The previous post titled, More on Why Weaponized Cell Phone Towers Are Popping Up Everywhere covered the first two important following topics in PART I & PART II. This post will contain PART III: The involvement of Chemtrails and the role they play. 1. Aside From the Cell Phone Towers, What Else Are The Telecommunication Giants Working On? 2. 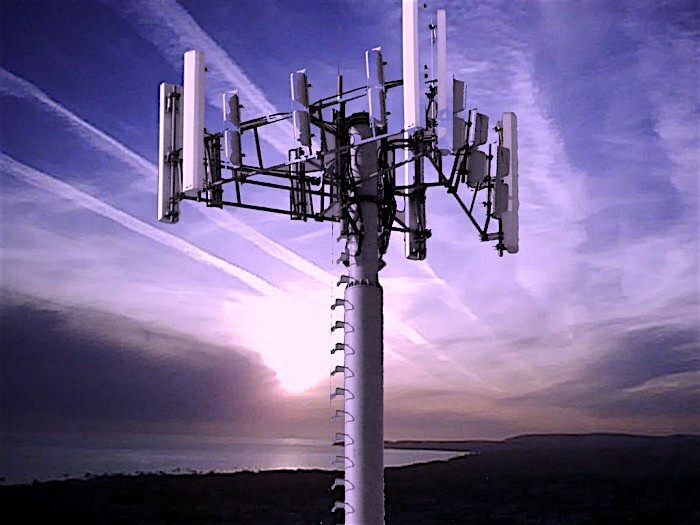 What are the Weaponized Cell Phone Towers? 3. How is Google Involved With the Government? 4. The Unthinkable – You Can’t Even Imagine! 1. Generally speaking, what is the Ionosphere that directed energy weapons take advantage of? HOLOGRAPHY/PROJECT BLUE BEAM – Whatever you do, don’t miss this! If you remember nothing else about all of this technology, remember this: Be afraid. Be very, very, afraid. There simply is no better way to sum up everything that follows better than those few words. This is the mother lode of all posts dealing with Chemtrails and related matters. Brace yourselves. My post will draw from two previously written and well footnoted articles written by Peter A. Kirby at Activist Post. As for any skeptics you hear jawing about “conspiracy this,” or “conspiracy that,” usually know-it-all pilots in my experience, hand them all the footnotes to both articles and ask that they please place ALL the footnotes in their mouths to prevent spreading their ignorance until they’ve read the material. To fully comprehend what Kirby’s new article has to say, it really helps to have already read his previous post titled, “Chemtrails Exposed: A History of the New Manhattan Project.” Before getting into Peter’s most recent findings, which are in keeping with research I’ve done very recently and will share as well, first I’ll briefly summarize the previous article, and you can watch the video titled “Chemtrails: The Secret War.” After the video, I’ll highlight the areas covered in the remainder of this article. In essence, since America has been the world’s technological leader; especially in the area of military technology, America has been the one leading the way on the New Manhattan Project from the beginning, and continues to do so to this day. So far we have only discussed the New Manhattan Project’s most obvious aspect: weather control. Just in that aspect alone, the New Manhattan Project is easily the biggest scientific endeavor in Human history. Believe it or not, it appears that quite a few other massive projects have been piggybacked upon this global weather modification scheme. They are already spraying us with megatons of aluminum, barium, and strontium. That right there is enough to put people away in prison for the rest of their lives, or worse. So why stop there? The people responsible for the New Manhattan Project (NMP) have apparently gone for broke. What else might one accomplish by spraying stuff all over God’s creation and/or shooting electromagnetic energy all over the place? What else have these mad scientists been up to? As opposed to the more understandable weather modification aspects of the NMP, this article examines the NMP’s more unbelievable aspects. From mind control to Morgellons to Nikola Tesla’s death ray and more, this article examines the New Manhattan Project’s other agendas. Other than weather modification, the most probable purpose of the New Manhattan Project is mind control. It is well documented that certain types of electromagnetic energy waves can remotely manipulate people’s thoughts and feelings. The relevant field here is known as “psychotronics” and “psychotronic weaponry.” A cursory overview is presented here with an emphasis upon the potential use of these technologies as part of the New Manhattan Project. If anyone has ever called you a “Conspiracy Theorist,” then you are almost certainly already familiar with “Operation Paperclip,” a crime against humanity perpetrated by the United States government in the aftermath of World War II that still continues to plague the world today both in it’s lingering affects on victims, and also in what some would say is the continuity of many of those programs to this day operating as black ops. Arguably, the MK Ultra mind control program is the most well known program to come out of “Operation Paperclip,” largely because of references to it in modern pop culture movies and television hits like The X-Files. The following video also gives a horrifying, but brief, overview of the program, which should begin to put the Fake Cell Phone Towers into context. In the video below, Youtuber Dark5 gives a breakdown of the 5 Most Shocking CIA Experiments of Project MKULTRA (that we’ve been able to uncover). Not only can electromagnetic frequencies influence one’s mind, they can also affect the rest of our bodily functions. Research by Dr. Robert Becker, Dr. Thomas Valone, and many others have strongly correlated the Human body’s functions to electromagnetic fields. This correlation is due to the fact that the Human body is a complex bioelectric organism highly susceptible to electromagnetic energies and fields. The ionospheric heaters used as part of today’s New Manhattan Project can produce the extremely low frequency (ELF) signals that affect our moods, thoughts and bodily functions. Not only that, but the two most important New Manhattan Project scientists (Bernard Vonnegut and Gordon J.F. MacDonald) were into it. One thing that’s important to note up front: Whether we’re talking about weaponized cell phone towers, Google’s Humanoid Robots That Can Hunt Down Humans Even in Dense Woods, or we’re talking about one of Google’s otherMachines Designed to Hunt Humans (both shown below), all were designed with the same outcome in mind, and that’s total control over their “subjects. Our military’s involvement in these types of technologies originated with something called Project Sanguine. Project Sanguine was a proposed, mid- to late-1950s Navy project developing a long-distance submarine communications system. The proposed project involved burying tens of thousands of miles of wires a few feet underground. These wires were to send extremely low frequency (ELF) signals to submerged submarines many thousands of miles away. Although Project Sanguine was never implemented, a similar type of operation (this time using above ground wires) in northern Michigan and Wisconsin exists today and has been in use since the mid-1970s. Project Sanguine and today’s facilities in Wisconsin and Michigan was and are not about mind control; only Naval communications. But Project Sanguine was the first inkling of what was to come. One can make an estimate of the concentration of the field around an object or man by considering the potential in space in which it exists. For example, in a field of 100 volts cm?¹ a man’s head is in a region where the potential is about 20,000 V with respect to ground. Because of the relatively high conductivity of the body the man’s head is at ground potential and therefore a corresponding amount of charge has passed from the ground up to his head. If we approximate the head as a sphere of 10 cm radius, its capacity is about 10?¹¹ farads so the induced charge on it is about 2 x 10?? coulombs and the field at its surface is approximately 2000 volts cm?¹. Accordingly, we see that the field and hence the rate of aerosol deposition should be about 20 fold greater on the man’s head than on the ground. The enhanced low-frequency electrical oscillations in the earth-ionosphere cavity relate to possible weapons systems through a little-understood aspect of brain physiology. Electrical activity in the brain is concentrated at certain frequencies, some of it extremely slow, a little around five cycles per second, and very conspicuous activity (the so-called alpha rhythm) around ten cycles per second. Some experiments have been done in the use of a flickering light to pull the brain’s alpha rhythm into unnatural synchrony with it; the visual stimulation leads to electrical stimulation. There has also been work on direct electrical driving of the brain. In experiments discussed by Norbert Wiener, a sheet of tin is suspended from the ceiling and connected to a generator working at ten cycles per second. With large field strengths of one or two volts per centimeter oscillating at the alpha-rhythm frequency, decidedly unpleasant sensations are noted by human subjects. The Brain Research Institute of the University of California is investigating the effect of weak oscillating fields on human behavior. The field strengths in these experiments are of the order of a few hundredths of a volt per centimeter. Subjects show small but measurable degradation in performance when exposed to oscillating fields for periods of up to fifteen minutes. The field strengths in these experiments are still much stronger, by a factor of about 1000, than the observed natural oscillations in the earth-ionosphere cavity. However, as previously noted, the intensity of the natural fluctuations could be increased substantially and in principle could be maintained for a long time, as tropical thunderstorms are always available for manipulation. The proper geographical location of the source of lightning, coupled with accurately timed, artificially excited strokes, could lead to a pattern of oscillations that produced relatively high power levels over certain regions of the earth and substantially lower levels over other regions. In this way, one could develop a system that would seriously impair brain performance in very large populations in selected regions over an extended period. The scheme I have suggested is admittedly far-fetched, but I have used it to indicate the rather subtle connections between variations in man’s environmental conditions and his behavior. Perturbation of the environment can produce changes in behavior patterns. Since our understanding of both behavioral and environmental manipulation is rudimentary, schemes of behavioral alteration on the surface seem unrealistic. No matter how deeply disturbing the thought of using the environment to manipulate behavior for national advantage is to some, the technology permitting such use will very probably develop within the next few decades. The mind control technologies detailed here by MacDonald have been in development by the Stanford VLF Group. Coherent ELF energies have the unique and interesting property of almost lossless propagation within the earth-ionosphere cavity waveguide, and attenuation of these signals due to distance from transmitter sites is negligible. Power losses are .8 dB per Mm (million meters). The magnetic vectors, unlike electrical (E-wave) components, permeate any substance and cannot be effectively shielded, even by iron, mu-metal, lead, copper, ‘Faraday cages,’ etc. The established physics of radio propagation therefore suggests that vast geographical areas can be readily mood-manipulated by transmissions of EM energy within the earth-ionosphere cavity waveguide. Some of these potential uses include dealing with terrorist groups, crowd control, controlling breeches of security at military installations, and antipersonnel techniques in tactical warfare. In all of these cases the EM systems would be used to produce mild to severe physiological disruption or perceptual distortion or disorientation. In addition the ability of individuals to function could be degraded to such a point that they would be combat ineffective. Another advantage of electromagnetic systems is that they can provide coverage over large areas with a single system. They are silent and countermeasures to them may be difficult to develop. The 1995 paper “On the Possibility of Directly Accessing Every Human Brain by Electromagnetic Induction of Fundamental Algorithms” by Professor Michael A. Persinger, PhD says that relatively weak atmospheric signals (such as those used for cell phone communications) can have a great influence upon the way people think and feel. The New Manhattan Project’s ionospheric heaters can produce such signals. EMR [electromagnetic radiation] in the brain occurs in waves measured according to cycles per second (Hz). 1-3 Hz = delta waves, characteristic of deep sleep. 4-7 Hz = theta waves, characteristic of high emotion, violence, and frustration. 8-12 Hz = alpha waves, characteristic of meditation, relaxation, and ‘searching for patterns.’ 13-22 Hz = beta waves, characteristic of frontal brain activity, deliberate effort, and logical thought. Brain waves are subject to the principle of resonance. Energy-waves reaching the brain through any medium – eyes, ears, or flesh – will tend to induce the brain-waves to cycle at the same wavelength. Brainwave resonance (‘BWR’) is significant to SLIPC [subliminal involuntary psycontrol] in both passive and active contexts. Passively a human-interactive environment may be permeated with EMS [electromagnetic spectrum] waves at one or more of the BWR ranges, inclining those within it to their induced characteristics without their conscious awareness. Attempting a relaxed, pleasant, cooperative discussion of a mutual problem is more possible in an alpha BWR than in a non-BWR one, and much more possible than in a beta one. Trying to accomplish anything complex or create immersed in delta is exhausting and fruitless. Active employment of BWR utilizes frequency generators to project desired BWR into a MW [mind war] operational environment, to adjust the emotions and awareness of all individuals therein. Such generators may be strategic satellite-based platforms which transmit BWR both directly and through intrusion into existing, localized electronic media systems. BWR can, for instance, be inserted into the Internet to be passively and indetectably (absent such sensors) received and radiated by any accessing device, from television station to desktop computer or cellular telephone. Michael Aquino is a very interesting character. As of Jan. 1, 2015, his extremely extensive bio notes his latest position as Lt. Colonel, Psychological Operations, First Special Forces Regiment, U.S. Army. He has since been sheep dipped retired from this position. He is a Knight Eagle of the Boy Scouts of America. His Ph.D. dissertation was on the neutron bomb. 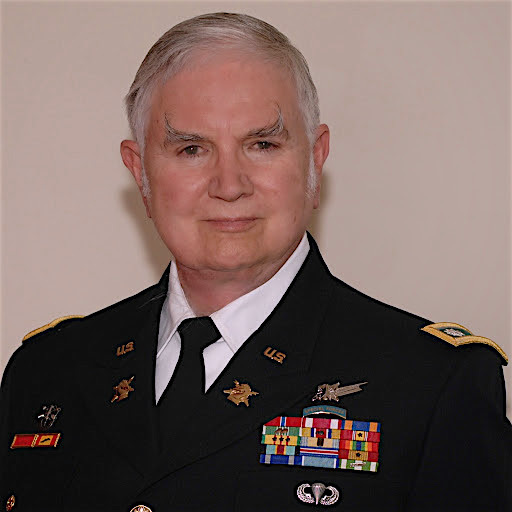 He has served as a “Space Activities Officer.” He has been given many military decorations and awards. He goes by the title of the 13th Baron of Rachane. He writes that he is a first degree satanist, a second degree warlock, and the high priest of the Temple of Set. The following video also comes from my post titled: Why Are Weaponized Cell Phone Towers Being Constructed Everywhere? The first video from that post (directly above) spent everything after the 1:45 mark of the video explaining how powerful some of these new cell phone towers are, and how their current configuration with mega cables is NOT set up for telecommunications or data transfer. After watching the video, and considering what the video makers said in conjunction with all the other information we’ve covered, I certainly wouldn’t put ANYTHING past the uber global elites. or the board rooms of multinational corporations, but I’m not so gullible that I’ll believe anything, so I kept digging. It was not easy to find information, and a few of the articles I found were several years old and most likely outdated, but I did find a few worth noting. The best one included the following video which does an EXCELLENT job of putting the highly technical supporting information below into layman’s terms. In short: The video gives you an idea of the full scope of how powerful these towers are, whether you understand the technical mumbo jumbo below or not. In the late 1980s, Dr. Aquino became embroiled in a highly publicized satanic ritual abuse scandal which, among other things, landed him on the Oprah Winfrey Show and the Geraldo Rivera Show. These interviews are available on YouTube. He published a 2014 book all about it titled Extreme Prejudice: The Presidio ‘Satanic Abuse’ Scam. Making people hear things that no one else around them can hear through the use of atmospheric radio waves is called “voice to skull” technology. This technology involves beaming sounds and speech directly into a subject’s head. This technology is well documented and well known. It has been demonstrated in many movies and television shows such as the movie Kingsman: The Secret Service and the TV showThe X-Files. The New Manhattan Project’s ionospheric heaters can do this. An early book titled Microwave Auditory Effects and Applications by James C. Lin, Ph.D. revealed the method. 1989’s U.S. patent #4,877,027 “Hearing System” defines this technology. Many scientific papers on the subject are available. There are a few ways Tesla’s death ray might be accomplished. It may be accomplished by tapping into the ionosphere, generating it independently, or a combination of both. The ionosphere (about 50-375 miles above earth’s surface) is home to Earth’s auroral electrojet. The auroral electrojet is comprised of extremely powerful magnetic energy encircling our planet. If lightning taps into that power by creating a circuit from the auroral electrojet down to the Earth, it will be incredibly powerful. This may happen naturally. A 1982 article co-written by the great New Manhattan Project scientist Bernard Vonnegut recounts the experiences of pilots who have witnessed lightning extending upwards, above storm clouds, presumably to the ionosphere. Man might also make this happen. It is conceivable that the New Manhattan Project’s ground-based ionospheric heaters (possibly in conjunction with other, similar space-based antennas) could induce lightning from the ionosphere. These antenna arrays could create a conductive path known as a “waveguide” which would cause the ionosphere’s energy to flow down to Earth. These waveguides can also direct the energy more accurately. The metals found in today’s chemtrails allow for better propagation of these energy waves. The Stanford VLF Group has been active in this area as well. Once again a small but capably armed country is threatening to seize its smaller but resource-rich neighbor. The Global News Network reports that the border has been violated. The same old story? No, the plot twists as a sophisticated satellite surveillance and reconnaissance system tracks the belligerent nation’s leader. As he steps to the podium to incite his troops to greater violence, a blinding light from above vaporizes him and his podium leaving even his bodyguards untouched. His smarter brother, the second in command, countermands the invasion orders and in 12 hours the borders are restored. Stability, if not peace, reigns again. This is not science fiction, but a mission well within the capabilities of Space Operations in 2025. At slightly higher powers, the enhanced heating produced by the laser can be used to upset sensitive electronics (temporarily or permanently), damage sensor and antenna arrays, ignite some containerized flammable and explosive materials, and sever exposed power and communications lines. The full power beam can melt or vaporize virtually any target, given enough exposure time. With precise targeting information (accuracy of inches) and beam pointing and tracking stability of 10 to 100 nanoradians, a full-power beam can successfully attack ground or airborne targets by melting or cracking cockpit canopies, burning through control cables, exploding fuel tanks, melting or burning sensor assemblies and antenna arrays, exploding or melting munitions pods, destroying ground communications and power grids, and melting or burning a large variety of strategic targets (e.g., dams, industrial and defense facilities, and munitions factories)—all in a fraction of a second. A high-power microwave (HPMW) device also employs electromagnetic radiation as its weapon effect. Not as powerful as nuclear-driven EMP weapons, HPMW weapons create a narrower band of microwave electromagnetic radiation by coupling fast, high energy pulsed power supplies to specially designed microwave antenna arrays. Microwave frequencies (tens of megahertz to tens of gigahertz) are chosen for two reasons: the atmosphere is generally transparent to microwave radiation (all-weather capability) and modern electronics are particularly vulnerable to these frequencies. The level of pulsed, electrical power required to produce weapon-level microwave fluxes is now becoming available (for ground-based systems). Compact, scaleable [sic] laboratory sources of narrow-band, high-power microwaves have been demonstrated that can produce gigawatts of power for 10 to a few hundred nanoseconds. Ultrawideband microwave sources are less well developed, but research in this area appears promising. A HPMW weapon should, however, be able to temporarily disrupt circuits and jam microwave communications at low-power levels. Lastly, the authors of “Space Operations: Through the Looking Glass” specifically mention the Iridium satellite constellation as one that would be suitable for producing high-power microwaves. The Iridium satellite constellation is noted in the author’s previous work “C4: Command, Control, Communications, and Computers of the New Manhattan Chemtrail Project” as particularly suitable for the New Manhattan Project’s remote sensing needs. Judy Wood, PhD in her book Where Did the Towers Go?, documents 1400 burned cars up to one half mile away from ground zero. Nothing else near them was damaged. Trees still had leaves on them. There were reams of unburned sheets of paper. Though they were covered with ash, no humans were burned. The exceptional thing about the cars, she notes, was the fact that they were not grounded while everything else was. Was some sort of electromagnetic weapon used on 9/11? If so, how did cave dwellers from Afghanistan get one of those? Maybe the original purpose of Raytheon is to come up with just such a weapon. Raytheon means “light from the gods.” Raytheon has been all about microwave technologies all along. Raytheon acquired E-Systems; the company that built HAARP. Somebody has apparently been planning ahead. If, from the megatons of aluminum and other toxins released into our biosphere, our environment becomes wrecked beyond being able to sustain life as we know it, don’t worry! People have been genetically modifying plants to be able to thrive in an aluminum-ravaged biosphere! Aluminum is the number one chemtrail ingredient. A certain genetically modified sorghum seed has been developed to thrive in aluminum contaminated soils. The makers of this sorghum seed reassure us that this type of genetic manipulation may also work well with many other food crops such as: wheat, barley, rice, maize, cotton, peanut, sunflower, tobacco, rye, alfalfa, tomato, cucumber, soya, sweet potato, grapes, rapeseed, sugar beet, tea, strawberry, rose, chrysanthemum, poplar, eggplant, sweet pepper, walnut, pistachio, mango, banana, and potato. It appears that sorghum is just the proverbial camel’s nose under the tent. The major aluminum tolerance gene, the SbMATE gene, encodes a root citrate efflux transporter that is Al-inducible at the level of gene transcription and is also Al-activated at the level of protein function. High level of expression of the SbMATE gene and the protein was found in roots. SbMATE orthologs with high degree of sequence homology were found in other higher plants, including rice. Successful transformation of Arabidopsis provides strong evidence that SbMATE can work across species to enhance tolerance to Al in other important crops grown in localities worldwide where Al3+ cations are present in acid soils and are toxic to plants. It is curious that this patent is assigned to (along with Brazilian officialdom) the United States of America as represented by the Secretary of Agriculture. One might think that this would be right up Monsanto’s alley. There may be some sort of deception going on here. We do know that historically the Department of Agriculture has acted like it works for Monsanto. As described in Marie-Monique Robin’s 2010 masterpiece “The World According to Monsanto,” the collusion between our Department of Agriculture and Monsanto has been pervasive. Maybe some sort of back room deal has been struck between Monsanto and corrupt elements of our federal government enabling Monsanto to profit from the rollout of these aluminum resistant seeds; a rollout designed to appear as a benevolent government action. If you noticed, one of the plants mentioned in patent #7,582,809 is poplar; a tree. If food crops don’t grow in an aluminum-ravaged environment, one can expect that trees won’t either. This is why we can thank our lucky stars that there is a corporation called ArborGen producing and selling genetically modified trees. They aren’t saying that their trees are specifically resistant to aluminum contaminated soils yet, but it’s good to know that they might help us in our future hour of need. Lastly, you can bet that the geoengineers will be here to help too. Our friends have developed wholly mechanical trees that can do what natural trees have traditionally done; remove CO2 from the atmosphere. For confirmation, search “carbon capture trees.” Who needs Mother Nature? We can have giant multinational corporations that will take care of everything! We are all but guinea pigs in their satanic Human experimentations. While today’s super-secret New Manhattan Project saturates our atmosphere with aluminum, barium, and strontium, the conventional weather modifiers have also admittedly been spraying us with a myriad of substances (other than silver iodide) ranging from urea (urine) to carbon black to lead iodide and much more. The books Clouds of Secrecy by Leonard A. Cole and In the Name of Science by Andrew Goliszek document hundreds of open air tests of all types of chemicals and biologicals on unsuspecting American citizens. In fact, our military’s position is that they get to spray us with whatever they want, whenever they want as long as they classify their activities as “research.” Knowing this, it is understandable that, for many decades now, we have been getting hit with everything under the sun. That’s right. As long as they classify their mass murder as a, “…peaceful purpose that is related to a medical, therapeutic, pharmaceutical, agricultural, industrial, or research activity,” they get to legally spray us with whatever they want whenever they want. As we can see now, this is exactly what they have done. It is interesting to note that this law was passed in 1997; right around the time that the New Manhattan Project’s large-scale spraying operations began. But that’s probably just a coincidence. Don’t think too much. It’s not healthy for the establishment. Human blood cells were found by a hospital lab technician in samples of gel-like material dropped over the tiny town of Oakville, Washington (pop. 665), covering a 20 square-mile area three times within a six-week period. Pulling into a gas station, officer Lacey pulled on a pair of latex gloves to clean his windshield. Lacey: ‘The substance was very mushy, almost like if you had Jell-O in your hand.’ Within hours, Lacey was in hospital unable to breathe. Chemtrails Confirmed goes on to recount multiple other instances of this human blood cell goo (presumably dropped from airplanes) splattering all over people, property, and the Earth. 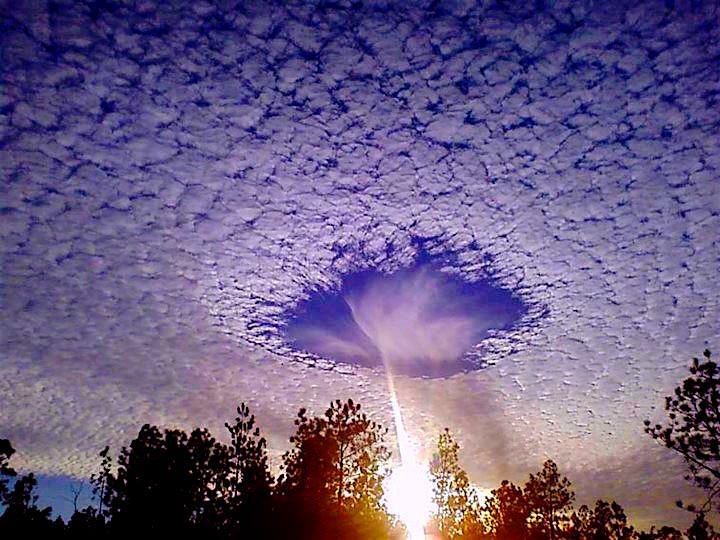 Weird Cloud Falls To Earth And Begins To Make Shapes!! What was captured on video looks like what might be causing one of the most widely documented “other” sprays; chem-webs. As noted in William Thomas’ book and in a myriad of online reports (the author has even been told this by people with first-hand experiences), a spider web-like substance is sometimes found covering grass, bushes, and trees. The substance is usually described as completely foreign to the particular environments; i.e., it is not spider webs. Despite what the shills claim, this stuff was probably sprayed from an airplane. Anything that contains semi-conductor material is laced with dangerously toxic elements like cadmium and germanium. If these particles are small enough to float in the air, they will be inhaled by people and animals. This type of technology is also known as “microelectromechanical systems.” Although the current, known state of the art pertaining to smart dust is motes (pieces of smart dust) as small as a few millimeters in size, secret technologies bringing the size of such machines down to the micrometer scale may be available. As one can see from the above passage, they are working on it. Technological advancements in MicroElectroMechanical Systems (MEMS) have inspired a revolutionary observing system known as Global Environmental MEMS Sensors (GEMS). The GEMS concept features an integrated system of MEMS-based airborne probes that will be designed to remain suspended in the atmosphere for hours to days taking in situ measurements over all regions of the Earth with unprecedented spatial and temporal resolution. The GEMS concept is revolutionary because it foresees the future integration of evolving technologies to realize an observing system with scalability and applicability over a broad range of weather and climate phenomena. GEMS have the potential to expand our understanding of the Earth and improve weather forecast accuracy and efficiency well beyond current capability. Resulting improvements in forecast accuracy will translate directly into cost benefits for weather-sensitive industries worldwide, and mitigate the risk factors associated with life-threatening weather phenomena. Lastly, other engineered particles called “niobate ring resonators” could conceivably be sprayed from aircraft for surveillance purposes. Lithium is highly toxic to Humans and can cause tremors, nervous-system collapse, and death. Reports of fibers growing out of people’s skin along with sores and subdermal crawling sensations have been pouring in. According to the Mayo Clinic, these symptoms generally occur along with severe fatigue, difficulty concentrating and short-term memory loss. The Mayo Clinic also notes that this, “…is a relatively rare condition that most frequently affects middle-aged white women.” Although the Centers for Disease Control (CDC) officially categorizes it as an “Unexplained Dermopathy,” amongst us common folk, this disease is being called Morgellons. Many people are claiming that Morgellons disease is caused by chemtrails. 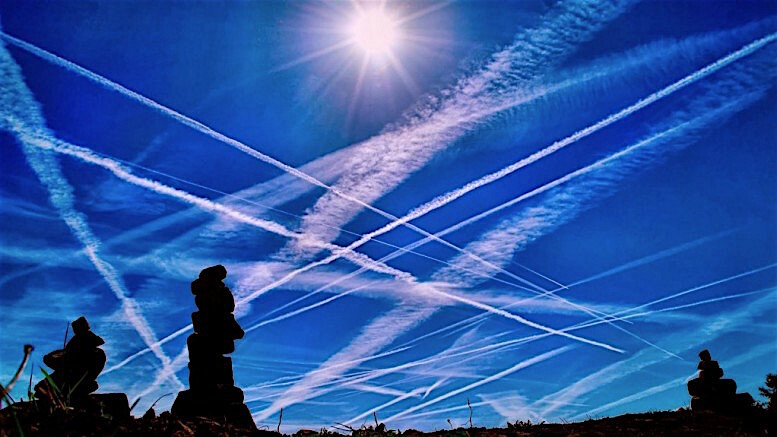 Whether or not Morgellons is caused by the usual chemtrails consisting of aluminum, barium, and strontium, or is caused by other sprays is unclear. But people have been drawing connections between heavy chemtrail spraying and Morgellons. There is an overwhelming amount of information available online. A man named Clifford Carnicom has been at the forefront of investigating Morgellons. He suggests that a substance at least similar if not identical to the aforementioned goo consisting of Human blood cells may be causing Morgellons. He suggests that Morgellons is not a skin condition, but rather a systemic condition not limited to our bodies. He suggests that every living thing on this planet is currently being affected by whatever is causing Morgellons. Are you a Christian that believes in aliens? Does that make you wonder if you’re really a Christian? Have you found it hard to reconcile the virtual impossibility that we are alone in this vast universe with your Christian upbringing, but you’ve kept your thoughts to yourself out of fear of ridicule? If so, the following video is for you. The following video features two prominent authors, who also happen to be devout Christians and biblical scholars, Tom Horn and LA Marzulli. Both have written a number of both fiction and non-fiction books dealing primarily with the phenomena surrounding Genesis: Chapter 6, known as the Nephilim. Once you hear them explain a view taken by many of the worlds most renown biblical scholars, it should help you better reconcile any Alien/Christianity issues you may be dealing with, and further explain the meaning behind some current events you may not have paid any attention to otherwise. Both men have written extensively, and the video below is fantastic, so I’m going to try to recap it as quickly as I can, so we can move into how the New World Order is going to use the faith of Christians against them. We’re already seeing test runs around the globe. “Let no man deceive you by any means: for that day shall not come, except there come a falling away first, and that man of sin be revealed, the son of perdition; Who opposeth and exalteth himself above all that is called God, or that is worshipped; so that he as God sitteth in the temple of God, shewing himself that he is God.” (2 Thessalonians 2:3-4 KJV). The “falling away” spoken of means a turning away from the truth, a turning away from God, a turning away from Christianity. That part of the scripture is now fulfilled, and is continued to be fulfilled in the lives of people daily. In these end times, people who are living in the good world that Christianity has created (even with all it’s problems, it’s still better than it would have been without Christianity) have decided that Christianity is unrighteous and judgmental. WHAT BETTER WAY TO USHER IN THE GREAT FALLING AWAY THAN A FLYING SAUCER OVER D.C.? FURTHERMORE, WHAT IF THE ALLEGED CRAFT WAS ABLE TO SHOW HOLOGRAMS OF OUR DISTANT PAST WHEN OUR “SPACE BROTHERS” ALLEGEDLY MANIPULATED OUR DNA AND CREATED US? WHAT A PERFECT HOAX, AND THE HOLOGRAM TECHNOLOGY HAS BEEN TESTED LATELY! Tell me how there would be ANY means faster than that to get Christians to fall away. Now, pull yourself our of the Bible and Theology for a moment, and ask yourself what is happening around the globe to Christians? The New Wold Order KNOWS it must get people to abandon their faith to take absolute control. A fake deception like this has been in the works so long it has a code name: Project Blue Beam. New Manhattan Project operations create a situation conducive to the production of holograms. The substances sprayed into our atmosphere (particularly barium) can act as a three dimensional reflective screen onto which beams of electromagnetic energy can be projected. This is how holograms are made. Not long before his death, Canadian journalist Serge Monast made public something he said he had uncovered called Project Blue Beam. He said it was an establishment plan to destroy all national sovereignty and religions; replacing them with a dictatorial one world government and a satanic one world religion. This was largely to be accomplished, he claimed, by the use of incredibly realistic holographic imagery, projected in the sky and on the Earth, depicting an alien invasion. This fake alien invasion was to be used as a catalyst for all the people of the world to give up their countries and religions in favor of only one religion and only one government in order to unite against the perceived alien threat. The chemtrails sprayed as part of today’s New Manhattan Project have the potential to serve as the screen upon which the Project Blue Beam movie is projected. The aforementioned voice to skull technology could be broadcast over the audience as well to create a show with both images and sound. We know that mass murder is taking place. We also know that two of the world’s most prominent geoengineering advocates are also population reduction advocates. There are also abundant calls for depopulation from many high-ranking establishment types. Considering all this in total, it is reasonable to believe that the many deaths caused by geoengineering are not simply an unfortunate side-effect, but rather part of a global depopulation agenda. John P. Holdren is the sitting Presidential science advisor. He is also a geoengineering advocate. He regurgitates the same talking points that the geoengineers do. Without admitting that solar radiation management geoengineering (chemtrails) is currently happening, he says that it might be a good thing to do because global warming is such a big problem. He, of course, couches this assertion in all sorts of disclaimers just like the geoengineers do. But the fact remains that, under certain circumstances, he recommends it. There are many reports of Mr. Holdren’s position available online. John Holdren is also a population reduction advocate. In fact, he is possibly the most prominent population reduction advocate. Back in 1977, Holdren co-authored a book called Ecoscience. In this book, he and his co-authors advocate for population reduction; a.k.a. mass murder. Holdren and his cohorts call for forced abortions, mass sterilizations, and a United Nations “Planetary Regime” with the power of life and death over American citizens. William Gates III, the co-founder of Microsoft, is another geoengineering advocate of the highest profile also advocating for population reduction. Bill Gates funds geoengineering. On Stanford University’s website, it says that Bill Gates funds solar radiation management geoengineering research through something called the Fund for Innovative Climate and Energy Research (FICER). His geoengineering advocacy is further detailed in a 2012 Guardian article. His father was the head of Planned Parenthood; an organization that has been reducing the population quite effectively for many years now. Now that Mr. Gates has conquered the world of business, he has apparently become a “philanthropist.” He wants to help all right. He wants to help us into our graves. Ted Turner, the founder of CNN said, “A total population of 250-300 million people, a 95% decline from present levels, would be ideal.” There are many other examples. Depopulation is a theme common among the socio-economic elite and their brainwashed sycophants. What most of these people fail to understand is that the problem is not overpopulation. The problem is the establishment’s extremely poor management. It is a known fact that better education results in fewer births and smaller family sizes while they promote dumbed-down garbage like Common Core. Clean, free energy technologies have been brutally suppressed for over 100 years in favor of their pollution-spewing multinational oil and gas conglomerates while they tell us we have to give up our quality of life because of pollution and the supposedly resultant Global Warming. Many other examples of the establishment’s extreme mismanagement abound. Another book could be written. The Georgia Guidestones is a massive monument located in Elbert County, Georgia. 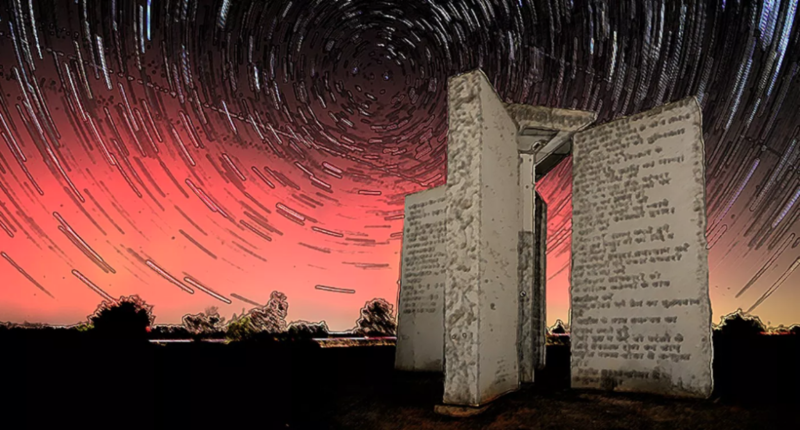 Consisting of 5 granite slabs (plus a capstone) over 19 feet high and weighing over 21 tons each, the same message to Humanity is carved in 8 different languages. Along with some other rubbish, the stones read, “MAINTAIN HUMANITY UNDER 500,000,000 IN PERPETUAL BALANCE WITH NATURE.” The current population of the Earth is over 7,000,000,000. Maybe if the makers of the Georgia Guidestones do a really good job with vaccines and other “health care services” like Bill Gates suggests, they can kill 6.5 billion people. As shown in the above information, geoengineering is apparently not the only way the establishment is going about mass murdering us. But it sure is an effective one. In fact, short of thermonuclear war, the most effective way to mass murder a population is to spray megatons of toxic garbage all over them and their land. This is what the geoengineers are doing, and probably a lot more. Peter A. Kirby is a San Rafael, CA researcher, writer, and activist. Check out his ebook Chemtrails Exposed: A New Manhattan Project.